In 2013, Jason joined forces with the Cleveland Indians where he currently plies his trade. Giambi is one of the most popular figures in modern baseball. He has featured for the All Stars on five occasions. He has also been the leader of walks in the American League four times, three times in on-base percentage and in slugging percentage and doubles once each. He has also won the coveted Silver Slugger prize on two instances. Despite a prolific career in baseball, Giambi has revealed to taking performance-enhancing drugs in his career. He has also offered a public apology for the same. 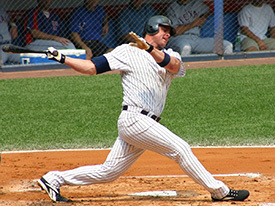 Men's Fitness – one of the most popular fitness magazines – named Giambi among the top ten 'Most Superstitious Athletes'. Giambi's honours cabinet looks impressive as he boasts of several prestigious awards including the Player of the Year for the Oakland Athletics in 1999, 2000, and 2001, the Most Valuable Player in the American League in 2000, the First Team Major League All-Star 1B in 2001, the Second Team Major League All-Star 1B in 2002, the American League Silver Slugger Prize in 2001 and 2002, the Home Run Derby Winner in 2002, and the American League Comeback Player of the Year in 2005. 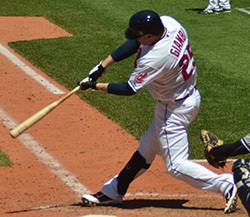 Jason Giambi has recorded impressive stats over the course of his career. His batting average stands at .278, having batted in 1436 runs. He has 2002 hits to his name and 403 doubles with a slugging percentage of .519. Giambi has hit a total of 438 home runs in his career thus far, making him one of the favourites to join the legendary 500 Home Run Club. Jason Giambi will be remembered for his tenure with the New York Yankees after facilitating a move from the Oakland Athletics. His former team and his fans seemed distraught with his decision to switch sides in 2002. As a result, he was subject to the wrath of the A's fans each time he visited Oakland with the Yankees. In May 2005, he was struck by a beer can as unruly fans voiced their discontent with his move to the New York club. 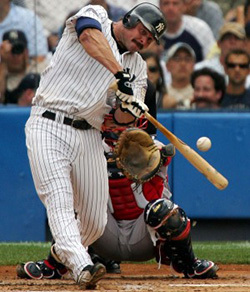 A year earlier, Giambi was diagnosed with benign tumour. As a result, he was placed on the disabled list. Following treatment, he returned to the ballpark and featured for the Yankees with impressive performances. By the end of the year, Giambi made it to the 2004 Major League Baseball All-Star Game even after recording only twelve home runs and a batting average of just .208 that year.